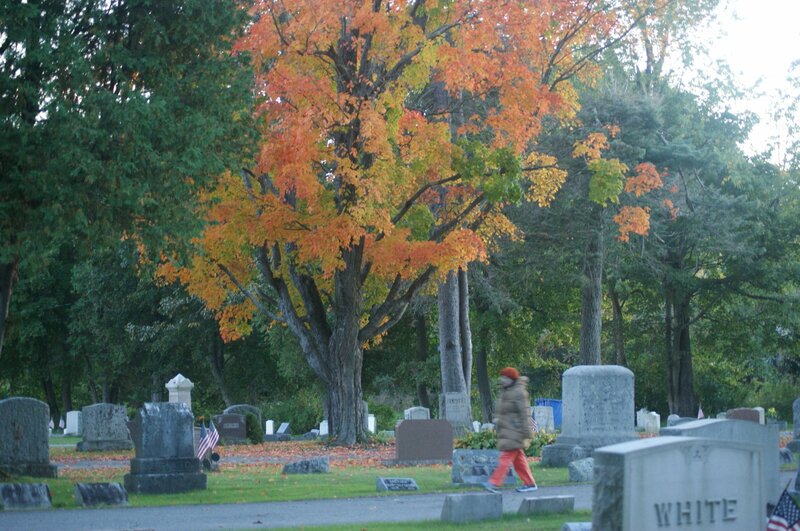 As autumn slips into winter, I thought it would be nice to share some images from the Crystal Lake Cemetery when the season was just beginning and color was gradually flashing into the foliage. 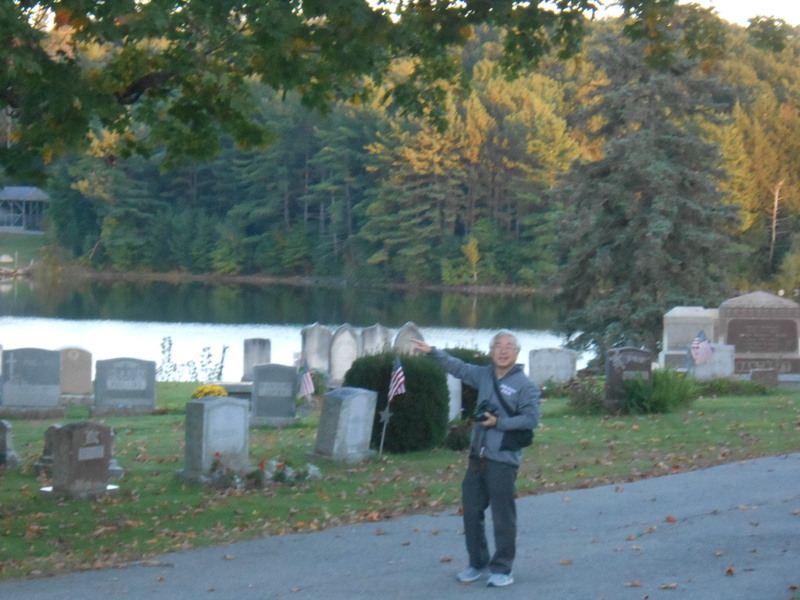 One Friday afternoon, Yang and I took a drive out to the cemetery for a walk and some photos, just as the sun was starting its creep into the other hemisphere. 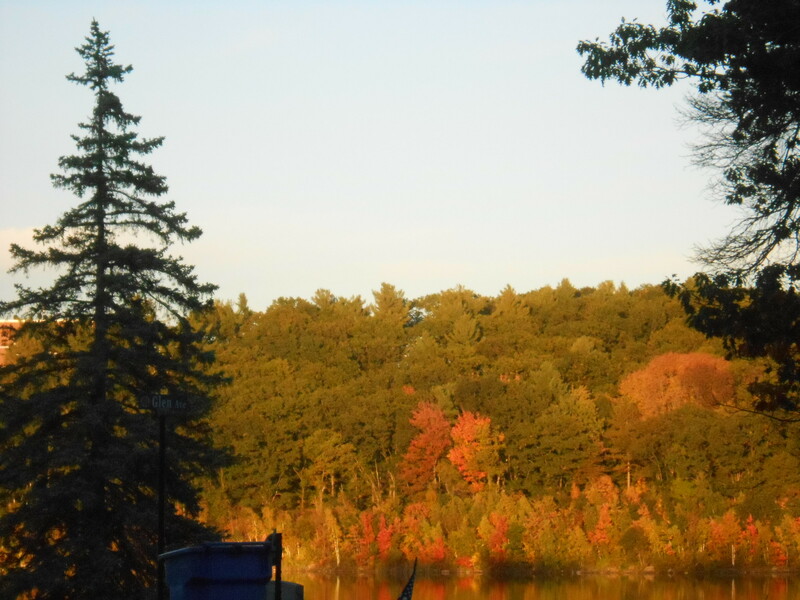 The view across Crystal Lake beautifully gleamed with setting sunlight. 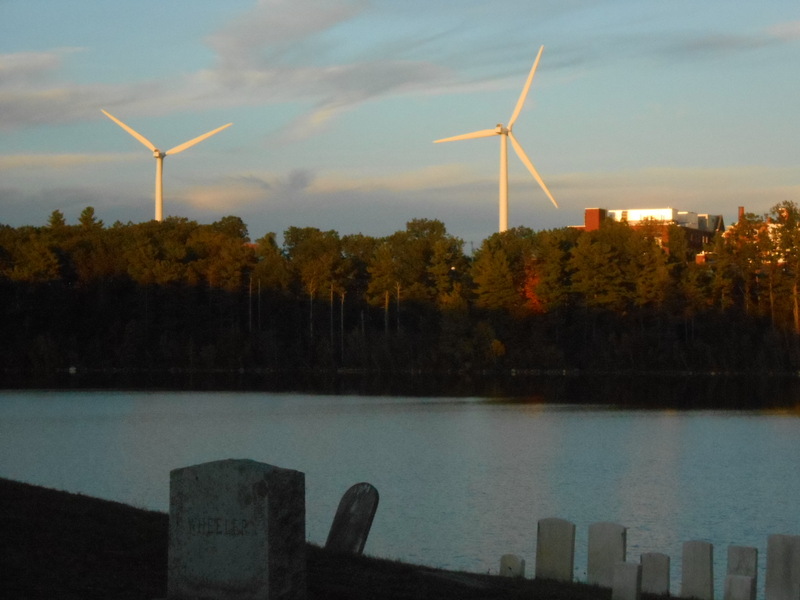 You could also see the windmills and classroom buildings at Wachusett Community College, glowing pink along with the clouds. 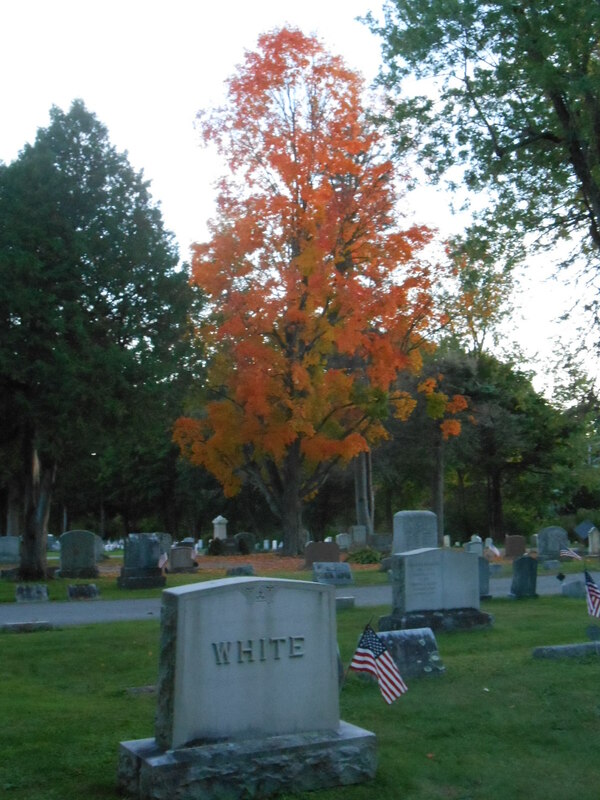 Most of the trees were still green, but there were several beautiful trees that asserted their flaming orange glory in the vanguard of seasonal change. You might see one tree peeping from behind the out buildings. 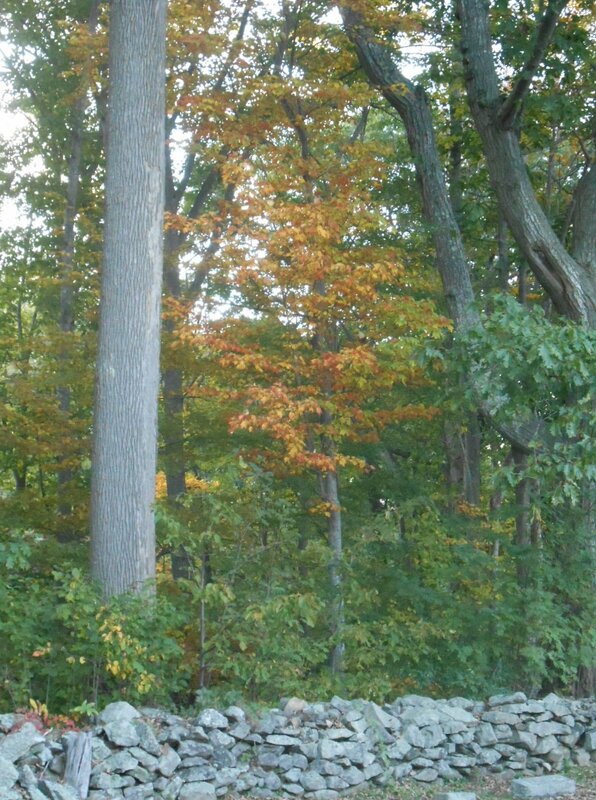 While another slender being rose and asserted itself amongst more imposing or darker trees with its delicate blending of yellow into orange flame from above a traditional New England stone wall. 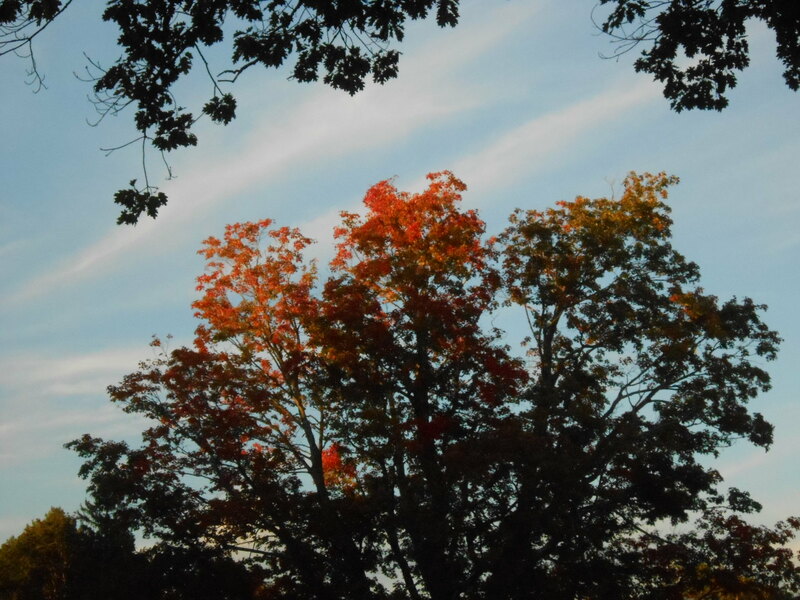 And how about this tree tossing it’s flaming foliage against the gorgeously pure, soft blue of a fall afternoon? 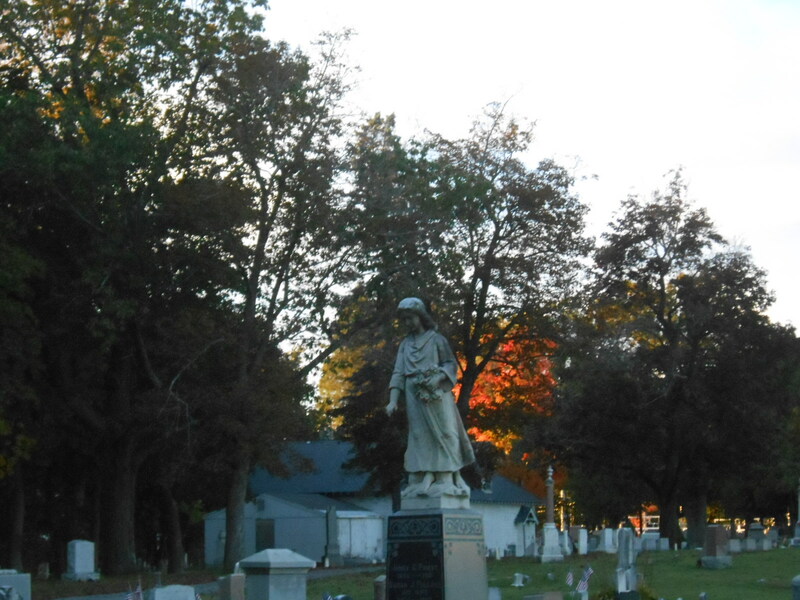 Notice that flash of fire behind the weather-worn statue of the little girl atop a child’s grave. And there I go, with a pair of jeans that color coordinate with the tree I’m walking past. So, what’s Yang pointing to here? 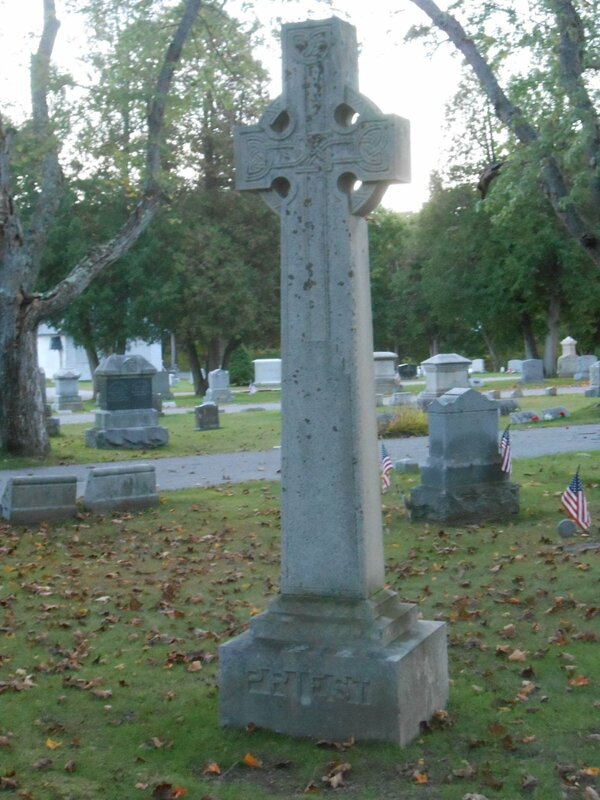 Must be one of the beautiful tombstones in this small but wonderfully located cemetery. 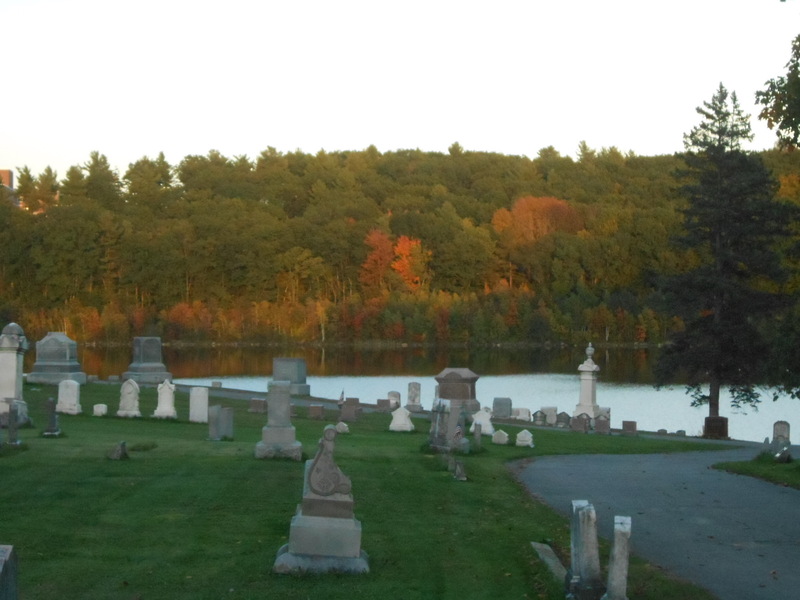 I love this shot of the stones complimented by the colorful foliage across the pond. But there are some more unique stones to appreciate. 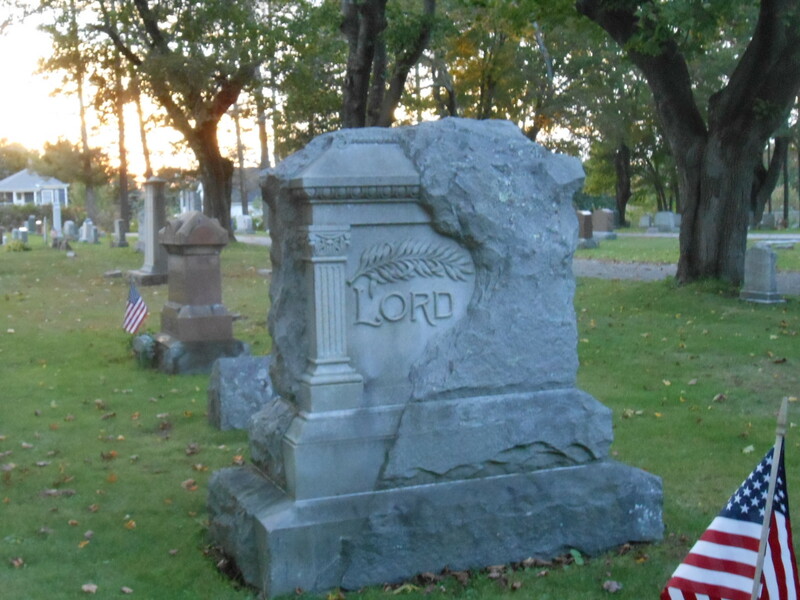 Then, there is this intriguing piece where the rock appears to be only partially hewn into a monument to the Lord family. 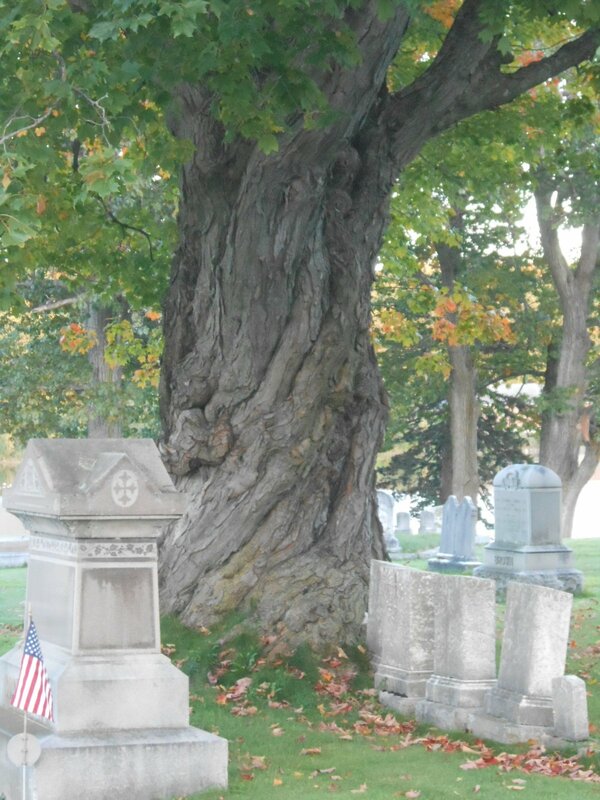 Particularly interesting is this enormous tree that almost seems to engulf a family’s several tombstones. I wonder if they had any idea how much it would expand when they first planted the enormous (I think) maple. It’s a little hard to distinguish the leaves. Well, this tree expanded way beyond what you might expect. 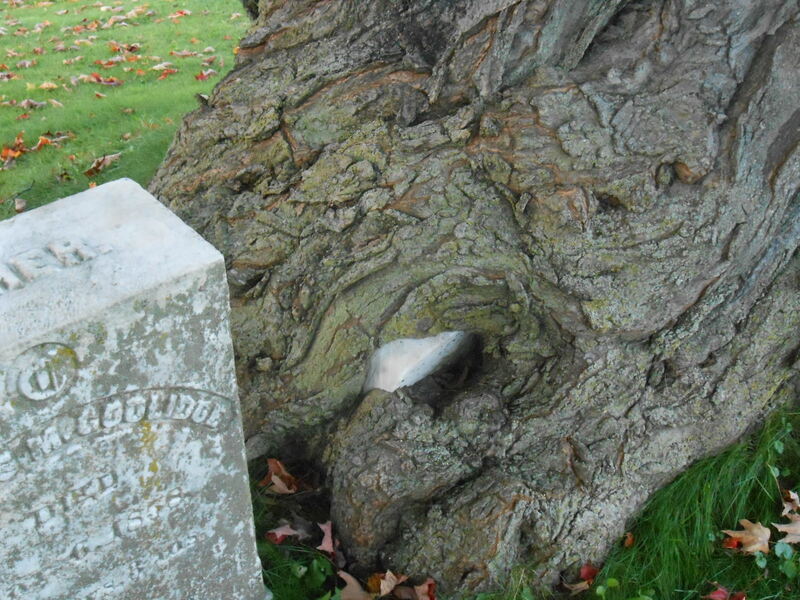 If you check out the photo below, you will see that one of the graves has been devoured by the tree. There’s a Lovecraft story in there somewhere – or maybe just a Lucy poem by Wordsworth. Let’s hope the latter. 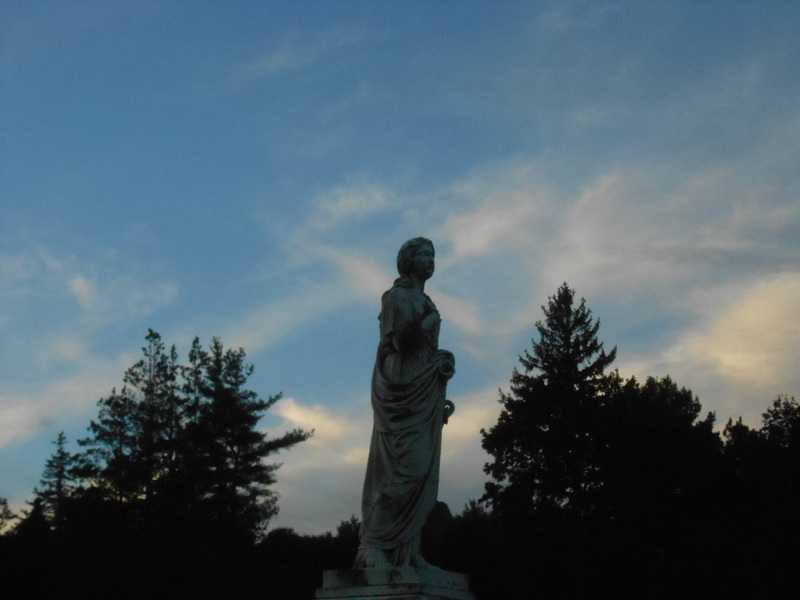 I’m especially caught up with this stone image of a woman raised up against the autumn sky, gently darkening blue, swirled with cloud white, her lineaments shadowed by approaching dusk. Haunting. Lovely and haunting. 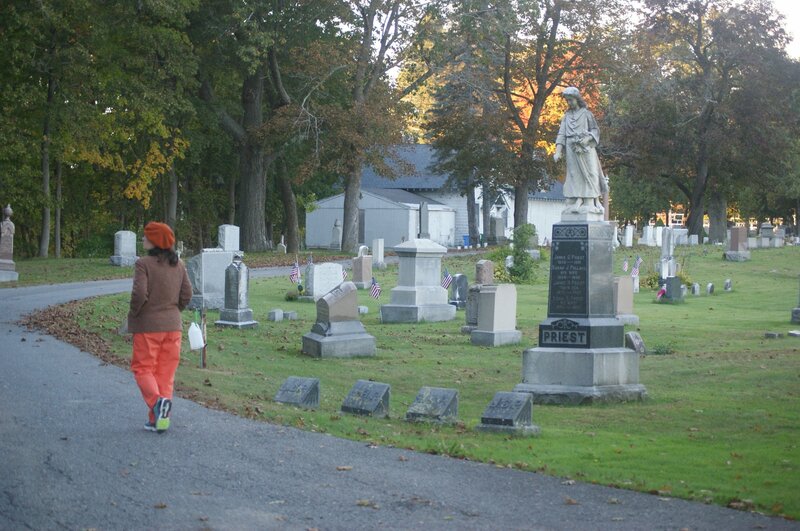 So, our visit ends and we will head off before it’s too dark and have a cozy dinner at a pub in Leominster. 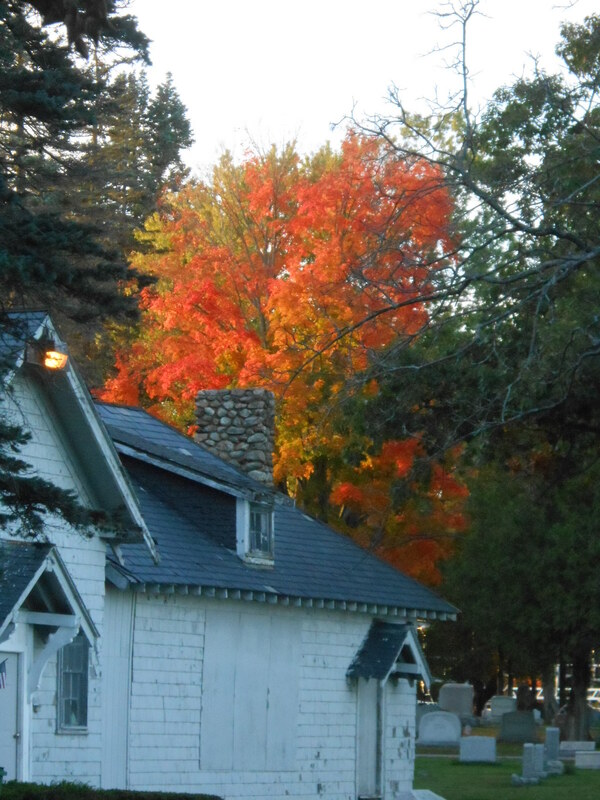 We may not have had a lot of foliage this autumn, but we were able to enjoy some splashes of beauty!